Samsung is in the process of adding new smartphones to its 2019 upgraded Galaxy A Series. The South Korean tech giant has begun to send out invitations to an event on April 10 to announce the new phones. The event will be live-streamed, hosting press events in Bangkok, Milan, and Sao Paulo for the company. Samsung has not specified the smartphone names to be unveiled next month, but Samsung has made it clear that there will be more than one Galaxy A-series smartphone. And we're expecting the Galaxy A90 to finally make its debut with what we've seen in leaks and official listings, possibly alongside the Galaxy A60, Galaxy A40, and Galaxy A70 smartphones. 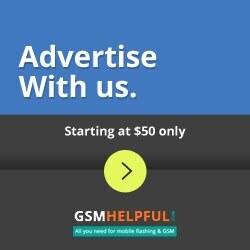 Samsung has launched the Galaxy A10, Galaxy A30, and Galaxy A50, so far in 2019. Samsung's official invitation states that at the event on April 10, the company will "unveil its latest Galaxy A devices," making it almost certain that more than one Galaxy A-series smartphone will be in the pipeline. As for the smartphones to be unveiled, the Galaxy A90 and the Galaxy A40 are the top candidates as both of them have recently been spotted on the official website of Samsung. However, the presence on the launch invite of three different tiles indicates that next month Samsung could launch three smartphones of the Galaxy A-series. 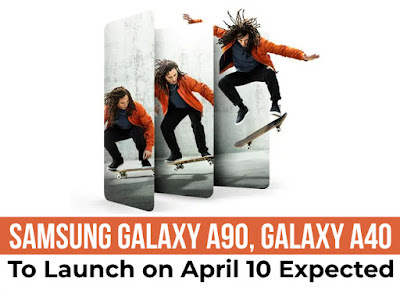 In addition to some Asphalt 9 content that will be available to buyers, the Galaxy A90 has recently been listed on the official Samsung US website. A sliding and rotating camera is rumored to be sporting. Concept renders and another leak, however, indicate that the Galaxy A90 could feature a selfie pop-up camera and sport the New Infinity Display without a hole-punch or notch. It is tipped with an optical fingerprint sensor in the display and a display of 6.41 inches. The Snapdragon 710 SoC is reported to power the Galaxy A90, while on the software side, one UI based on Android Pie will handle things. As for the Galaxy A40, the upcoming smartphone support page went live on the company's German website earlier this month as well as the Samsung UK website. In addition, the Galaxy A40 has already been awarded its FCC certification, meaning an official launch is on the horizon. Rumored to feature an in-display fingerprint sensor as well as a ToF 3D sensor, the Galaxy A40 will be powered by the in-house Exynos 7885 SoC, coupled with 4 GB RAM. The Galaxy A60, which is reported to have been certified Bluetooth, is another smartphone that could be launched next month at Samsung's event. Tipped to come with a 6.7-inch full-HD+ Infinity-U display, the Galaxy A60 is reported to be powered by the Snapdragon 6150 SoC, coupled with up to 8 GB of RAM and 128 GB of internal storage. The Galaxy A70 and the Galaxy A20e are the other two smartphones that have recently appeared in leaks and may be launched at next month's Samsung event.